Would you like to gift a token of friendship or love to someone special to make them feel good? Let us send this colourful leather wallet set on your behalf. Detail: The long wallet measusres 18cms/7" wide by 11cms/4.25" high; Little coin purse is 8 x 7.5cms; Tiny purse is 6 x 5.5cms. 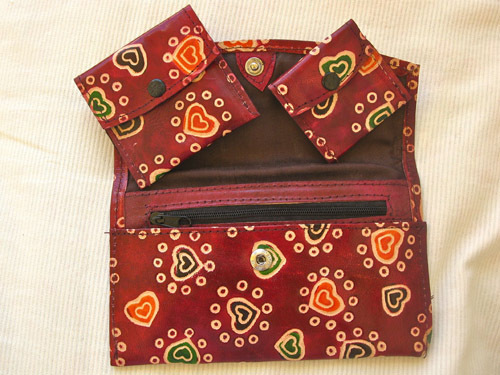 It features cheerful hearts on a burgundy coloured background and inside has 2 long compartments with a zipped one in-between. The set is completed with two little purses suitable for coins or small keys. Our Lovehearts wallet set would make a meaningful present for Mothers Day, Xmas, Valentines Day or just as a gift to show you care. Comes gift-wrapped, like all our presents - and we can print a personal message on your behalf.